a simple Indian curry, cook at a gentle heat, so the yogurt does not curdle. ​Put the lamb cubes in a bowl and mix in half the yoghurt. Toss until all the cubes are coated. Put onions, garlic, chilli, ginger, curry powder, cashew nuts and 3–4 Tbsp of water into a food processor bowl. Process to a smooth paste. Alternatively, finely slice everything, then stir in the water. 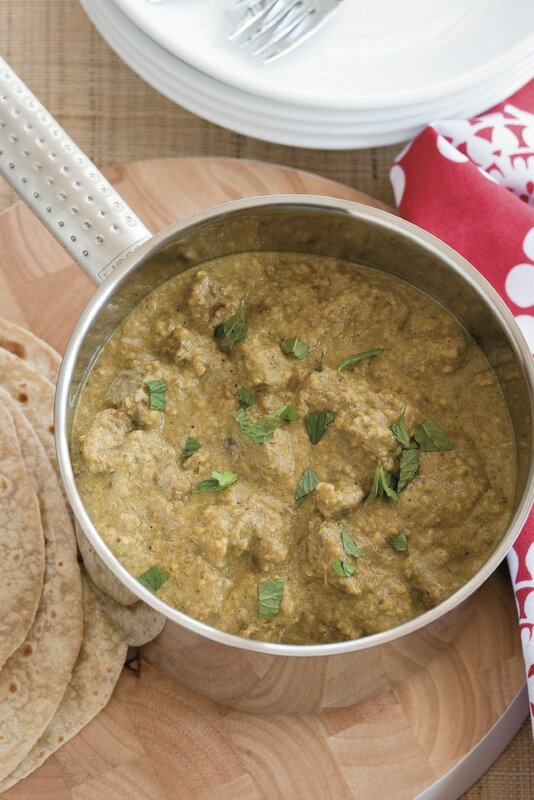 Heat a heavy-based saucepan, add oil and cook the spice paste over a low heat for 2 minutes. Once the sauce starts to thicken, add the lamb and season well with salt. Slowly bring to the boil, cover and turn down to a cook on low for 30 minutes. Stir occasionally to stop the sauce from sticking and burning. Add the remaining yoghurt, cover and cook for a further 15 minutes; by this time the sauce should be thick and the meat tender. Serve sprinkled with chopped mint leaves. Accompany with steamed rice, blanched green beans and warmed roti.